Background. 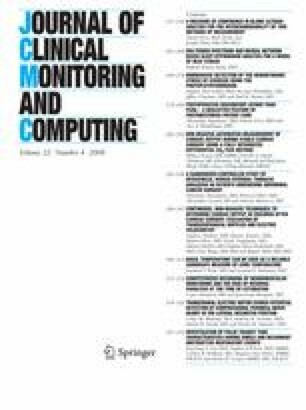 Continuous and non-invasive measurement of cardiac output (CO) may contribute helpful information to the care and treatment of the critically ill pediatric patient. Different methods are available but their clinical verification is still a major problem. Aim. Comparison of reliability and safety of two continuous non-invasive methods with transthoracic echocardiography (TTE) for CO measurement: electric velocimetry technique (EV, Aesculon™) and transesophageal Doppler (TED, CardioQP™). Methods/Material. In 26 infants and children who had undergone corrective cardiac surgery at a median age of 3.5 (1–17) years CO and stroke volume (SV) were obtained by EV, TED and TTE. Each patient had five measurements on the first day after surgery, during mechanical ventilation and sedation. Results. Values for CO and SV from TED and EV correlated well with those of TTE (r = 0.85 and r = 0.88), but mean values were significantly lower than the values of TTE for TED (P = 0.02) and EV (P = 0.001). According to Bland-Altman analysis, bias was 0.36 l/min with a precision of 1.67 l/min for TED vs. TTE and 0.87 l/min (bias) with a precision of 3.26 l/min for EV vs. TTE. No severe adverse events were observed and the handling of both systems was easy in the sedated child. Conclusions. In pediatric patients non-invasive measurement of CO and SV with TED and EV is useful for continuous monitoring after heart surgery. Both new methods seem to underestimate cardiac output in terms of absolute values. However, TED shows tolerable bias and precision and may be helpful for continuous CO monitoring in a deeply sedated and ventilated pediatric patient, e.g. in the operating room or intensive care unit. Schubert S, Schmitz T, Weiss M, Nagdyman N, Huebler M, Alexi-Meskishvili V, Berger F, Stiller B. Continuous, non-invasive techniques to determine cardiac output in children after cardiac surgery: evaluation of transesophageal Doppler and electric velocimetry. We are grateful for editorial assistance by Anne Gale of the Deutsches Herzzentrum Berlin.